From a Low–Cost Commodity to a Premium Brand | Fourth Dimension Inc.
Branding is an esoteric subject in marketing and management with many experts, consultants and gurus doing brisk business in helping companies to build and manage their brands. What is the secret of successful brandling? The success story of a Brazilian company which was able to transform its product from a local poor- man’s commodity into a fashionable and premium brand may throw some valuable insights. This article examines the branding journey of this Brazilian company in the light of integral management and its implication for Indian companies. Apargathas is a Brazilian company set up by two immigrants, Juan Echegaray and Robert Frazer, for manufacturing footwear. Initially the company’s low-cost footwear became a big hit. Called as Havaiana’s slippers, it became a dominant footwear product in the Brazil, achieving a mastering market leadership with 90% market share and selling 100 million pairs of slippers. Havainas became a household commodity sold to customers in every socio-economic category. But with rapid economic progress in Brazil and the socio-economic condition of people improving fast, sales of Havaiana chapels dropped to 35 percent. Two major factors caused this slump in the market. The more affluent sections of the society perceived Havaiana chapels as a poor man’s footwear worn by lower income groups like maids and construction workers. And the competitors moved in to seize the opportunity with more fashionable and premium products. The strategy clicked. In just six years, Apargatas managed to reverse the decline in sales. From 65 million pairs in 1993, sales raised up to 105 million pairs in 1999. Its net sales rose to approximately $ 1.27 billion with a net income of $ 152 million touching the highest in its history. The company expanded its operation beyond its national boundaries to other South American countries like Argentina with a similar strategy. The proximity and cultural affinities of these markets to Brazil, combined with the knowledge of the regional market helped the company to capture a large market-share in Argentina. 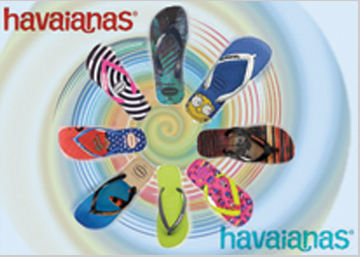 In 2008, the company launched its Havianas brand in New York and Paris retaining its Brazilian identity and spirit. And the US and European customers responded positively to the campaign and the sales picked-up. The company has opened its first retail shop in California. Haviana slippers were marketed as a high – end premium brand with 150 styles with praise ranging from $ 16 to $ 200. The company has recently revealed plans to launch their products in India and Pakistan. What are the key factors behind the success of Apargatas? The first part of the strategy is not something new but more or less well-known to all marketing processionals. All over the world, in all nations, when a section of the society achieves prosperity and moves from low-income to high-income category, its consumption patterns shrifts from indispensable necessities to affordable luxuries, seeking for variety, colors, style, fashion, and a recognition of its higher economic and social status. And most companies respond to this category of the customer with a more or less similar strategies like that of Arparagathas. The second part of the strategy with its stress on culture is not as common, though it is now increasingly recognized by marketing and branding gurus. Jan – Benedict E.M. Steencamp, distinguished professor of marketing in Kenan-Fangler Business School University says “brands should be linked to a country’s culture” and attributes the success of Apargatas to this cultural element in their strategy. “There are several positive-cultural meanings that customers around the world associate with Brazil” says Steencamp “vibrant colors, sensuality, youth, joy, fun and a sense of humor. Aparagathas used this identity to gain a global advantage. It was able to transfer these cultural associations to Havianas with a cleverly designed marketing strategy”. However culture is a complex system with a deep and subtle influence on people. There are many dimensions to a Nation’s culture. There is the outer form of culture made of its customs and traditions. There is a deeper and higher dimension of culture, which comes from the inner mind and soul of a nation and its civilizational roots, made of its basic value-systems. And in between, there is a psychological dimension made of some specific qualities or temperament of the people, shaped by many factors like evolution, environment and infiltration of the nation’s deeper and higher self in to the mind and life of people. An important part of this aspect of culture is self-perception of the people, what a group of people perceive themselves to be and also what other part of the world see in that culture. The Brazilian traits like youthful, relaxed, stylish or joy, fun, sense of humor, belong to this intermediate level of culture, and a part of the self-perception by the people. None of these qualities are entirely unique to Brazilians. America, more recently formed, with its youthful entrepreneurs and its passion for individual liberty, change and innovation is perhaps a much more youthful nation than Brazil. Similarly Italians are perhaps much more relaxed and the French people much more stylish, sensual and fashionable than Brazilians. However from the point of view of marketing, what matters is the self-perception. If the Brazilians think and feel that youthfulness, relaxed etc. as the unique character of their nation and its people and if a marketing strategy makes the right connect between this cultural factor and the promotional campaign, it has a positive impact on customer choice. Another important factor to note is that qualities like youthfulness, fun, joy; humor has a universal appeal transcending the specific nature of cultures. All of us, young or old and to whatever culture or nation we belong wants to feel or appear youthful, to be happy and enjoy fun and humor. So it is difficult to say precisely what is the main factor which leads to Apargatas’s cult-brand. It is perhaps a combination of factors like time-tested methods with the right cultural connect, which also contains elements with a universal appeal. We have here a balanced and effective formula for marketing success. However there are nations with a dominant uniqueness and a deep and lasting influence on its people. One of them is India, well-known all over the world as the land of religion, spirituality and yoga. In our modern age, most of the nations have lost touch with the roots of their civilization and culture. Only India is still has a living contact with its ancient spiritual roots. Even now India is producing great spiritual Masters who is giving a new form to the ancient spiritual wisdom. The great and ancient science of yoga is still lived and practiced in the hundreds of small and big Ashrams in India and by many thousands of seekers all over India. The ancient myths, symbols, epics and temples of India still hold a great appeal for Indian masses and some of them well-known all over world. So cultural motifs of India can be a very rich source for branding for Indian companies. As Knox Messy professor of marketing, points out “if there is an emerging market that can put cultural branding in practice, it is India. Its symbols and myths are known around the world.” However when these sacred symbols of India are used with an entirely commercial motive or with a dilution or distortion of their meaning, it is a gross form of exploitation, which may bring adverse results in the long term, because these symbols have a living inner power and misuse of them may have a negative reaction. For the Indian companies and for the Indian nation as a whole, the right strategy for branding it’s to incorporate the spiritual wisdom, vision and values of India and the deeper significance of its symbols in the promotional campaigns with a certain disinterestedness as a service to humanity. It is in fact a great service because the vision of India can lead humanity towards its highest spiritual fulfillment. If a company can do it with a creative force and a certain freedom from commercial motives it acquires a considerable amount of positive karma, which enhances its long term sustainability. Copyright © Fourth Dimension Inc.